The FMCG industry traces its origins back to the likes of Colgate Palmolive, founded in New York in 1806l Procter & Gamble, founded in Cincinnati, Ohio in 1837; and Coca-Cola, founded in 1886 in Columbus, Georgia. Over the subsequent years, these companies capitalised on the industrial revolution and economies of scale to become the household names they are today. Today, Coca-Cola is worth more than US$180B whilst P&G boasts a valuation of more than US$200B.However, while incumbents have enjoyed steady growth throughout much of the past Century, tides are beginning to change. Technology, changing consumer tastes, business model innovation, radically different ways of working and lower barriers to entry are fundamentally changing the game and forcing FMCG companies to rethink their business models. As the Greek philosopher Heraclitus put it, “the only thing that is constant is change”. Incumbents need to ready themselves for far more change than they’ve traditionally been built to navigate. Failure to do so is likely to result in extinction or at best, significant marginalisation. 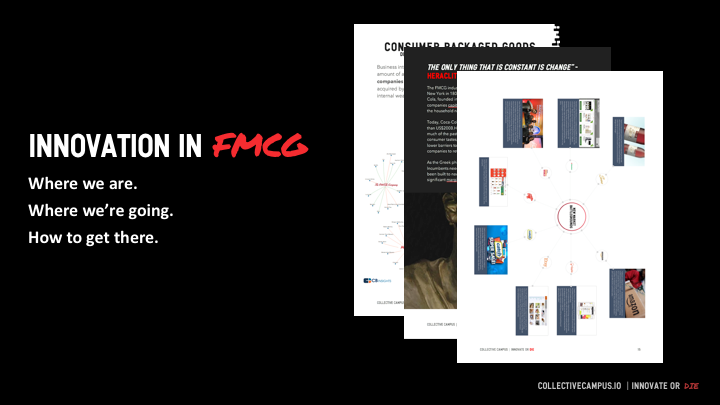 Download this ebook to discover what technological, business model, economic and social trends are shaping where FMCG is going and what incumbent firms or new entrants can do in order to capitalise on these trends and gain a competitive advantage in order to survive and thrive in this brave new world.